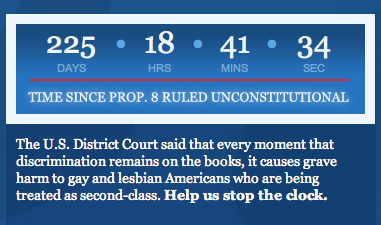 Prop 8, as you already know, was judged to be unconstitutional last year. What you may not realize, it that it’s been 225 days since that decision was made. So why are the constitutional rights of LGBT Californians and Americans still being violated. Please add your name to the petition to stop this discriminatory and unconstitutional law immediately by clicking here.